Earlier today, 14 lucky students got to wish His Majesty the King Happy Birthday! I’m very happy for them. On the happy occasion of His Majesty’s 29th Birth Anniversary, I join those successful students, and the entire nation, in wishing our beloved king Happy Birthday! And in offering prayers for His Majesty’s long life. May peace, prosperity and happiness flourish in Drukyul under the glorious reign of the Fifth Druk Gyalpo. I offer my congratulations to the recipients of the Druk Gyalpo’s National Day medals. My heartiest Tashi Delek! to all of them. Today, we celebrate our 101st National Day. Today will also mark the culmination of the year-long celebrations commemorating a century of peace, prosperity and happiness under our beloved monarchs. As we conclude the historic celebrations of 100 years of monarchy, we have many reasons to be deeply thankful: a secure and sovereign homeland, a vibrant culture and religion, a largely pristine environment, free healthcare and education, a unique democracy, and a growing economy. Simply put, we live longer, better and happier lives. And as we enter the next 100 years as a unified nation, we must uphold our two most important assets to ensure that we and future generations continue to enjoy peace, prosperity and happiness. The first asset is our monarchy. This important institution, which is the essence and very basis of our kingdom, must be protected, nurtured and cherished by all Bhutanese – in body, speech and mind – so that future generations can enjoy what we today take for granted. The second is our Constitution. This sacred document, gifted to us from the Golden Throne, must be defended – rights enjoyed and duties fulfilled – by all Bhutanese, for all time. Our Constitution came into effect on 18 July, 2008. 152 days have already passed since the historic signing of this sacred document, and it has still not been properly distributed. Forget farmers, none of the gups I’ve met have received a copy of the Constitution. Twenty months ago the Tarayana Foundation invited Bhutanese to compose poems celebrating His Majesty the Fourth King, Jigme Singye Wangchuck. 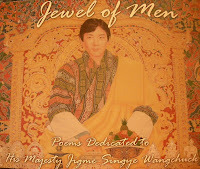 Of the more than two hundred entries, 25 poems were selected and compiled into the book “Jewel of Men”. These poems express the deep feelings – of love, affection and reverence – that all Bhutanese hold for our beloved monarch. “Jewel of Men” was launched yesterday by Her Majesty the Queen Mother, Ashi Dorji Wangmo Wangchuck, in a warm ceremony commemorating our Fourth King. Present were HRH Ashi Sonam Dechen Wangchuck, who delivered an eloquent welcome, and HRH Dasho Jigyel Ugyen Wangchuck, who gave us a poignant documentary about his relationship with his father and his monarch. I thank Her Majesty and Tarayana for voicing my innermost feelings on the Fourth Druk Gyalpo, His Majesty Jigme Singye Wangchuck, a giant among men, a king without equal, a jewel. The Coronation was a grand success! The Coronation – our coronation – showcased Bhutan’s unique culture and tradition. 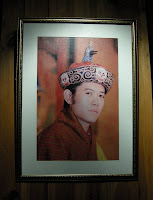 It also put on full display the love, affection and reverence that all Bhutanese have for our monarch. I offer my heartiest congratulations to all the people responsible for making this historic national event a resounding success: The NSCCC, Zhung Dratshang, Home Ministry, Tourism Council, Protocol Department, schools, police, Thimphu Dzongkhag and City Corporation, hospital, media, City Bus, Department of Works and Housing, utility companies, DNP, and many others. And I pay special tribute to the countless volunteers who came from all parts of our country and all segments of our society. They contributed their time, energy and resources to make the celebrations that much more enjoyable and safe, warm and special. Most of them worked behind the scenes and claimed no recognition. They worked long hours and shouldered heavy responsibilities. Farmers traveled long distances, some from very remote areas, to offer special cultural performances. Civil servants, especially the mid-level ones, sacrificed their long holidays to volunteer their services. Recent graduates ignored looming employment concerns and turned in full force, everywhere it seemed. The Citizens’ Initiative for Coronation and Centenary Celebrations organized a series of grand shows, and continue to do so to mark the centenary celebrations. The Local Chapter put on memorable events and lavished pins and posters of His Majesty the King to all people. They are patriots, all of them. Volunteering is not new in Bhutan. It is a central feature of life in our villages. That’s how we build our houses, work our farms, celebrate births, nurse the sick, support the grieving, and secure our communities. 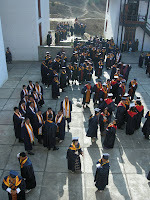 The Coronation Celebrations have shown that today’s urban Bhutanese are still ready to volunteer. That, in fact, volunteering is being taken to new heights. This, during our coronation, is a fitting tribute to our monarch. To all volunteers: Tashi Delek!